The Mexican plum is a small tree with loads of fruits at harvest time which is just about late summer all the way to late fall. The tree does well in almost all areas beginning with hilly places to bottomlands. It is single trunked and its bark changes with age. During its young age the bark is metallic gray but becomes rough and scaly as the tree grows older. The tree produces beautiful white flowers with a fragrant in early spring. The flowers are up to an inch wide. The maturity period of this tree’s fruits is critical in that there is a general food scarcity. As such wildlife is known to take advantage of the fruits taking away all the minerals, vitamins and moisture offered by the plums. The fruits are usually dark red or purple. The best thing about this tree is that it can grow anywhere even on the road side, power line edges, clear cuts and pipelines. The plant only stretches out a little to acquire some sunlight in order to produce a bounty fruit. The Mexican plum is rather tart making it very suitable for jelly. In fact its jelly is way tastier than most jellies. Its fruits are delicious when eaten fresh but they can also be preserved for later consumption. The species is used for grafting mainly because it does not sucker. It also grows singly and therefore it is not known to form thickets as may be the case with some other plums. 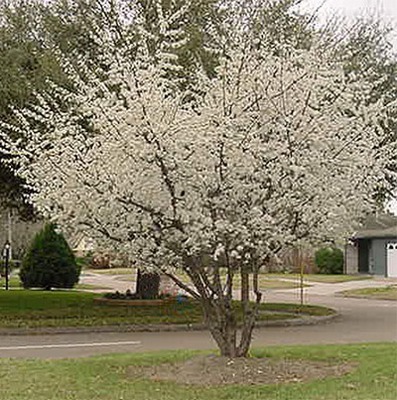 If you plant the Mexican plum tree in a well drained soil it may not be disturbed by any pests. However, the tree may occasionally be troubled by some insects that chew on its leaves. It is also not easy to transplant this tree from the wild unless the trees are very small. If you want to plant the Mexican tree do so using freshly planted seed as soon as harvesting has been done in fall. If you want to plant your seeds in spring clean them and stratify them at 41 degrees for a period of 60 to 90 days.